The saying goes, a picture is worth a thousand words. I feel like this is true for the viewer of a picture. For the photographer, a picture is worth a thousand memories. A photograph represents the photographer's perception of a real situation and the real events that led up to the final image. Photographs are up for interpretation, which means the viewer fills in the blanks and unknowns. Essentially they take the photographer's version of reality and turn it into their own story. Each person will see something different in any given photo. That to me is the beauty of the art of photography. I say this as both a photographer and as an appreciator of the work of others. Nature photography is unique, in that the goal (at least for me) is to capture an event in natural history and document it with a camera. But when done with an artistic eye, it goes far beyond simple documentation. With that in mind, I've always found it interesting to read other photographers' stories behind their images. A single photograph can mean so many things to each viewer, but for the photographer, more often than not, it's the experience of getting the photograph that is remembered, as much or more than the final product itself. It sounds cliche to say, but for me it really is the journey and not the destination. I've been out in the field enough to know that a photograph can come about in almost any way imagineable. A lot of the time it's pretty much what you would think-a lot of waiting, a lot of patience, a lot of days that didn't work out-eventually paying off with a great image. This is not always the case. Part of what keeps me so passionate about nature photography is that every time I walk out the door, I know I have a chance to see and/or capture the best image of my life. A once in a lifetime experience is always a potential as long as you get out there. Most photographers go out with a general plan of what they want to shoot for the day... a landscape, an animal, a general area to explore... 9 times out of 10 they end up coming home with an image of something entirely different than what they had originally planned for. Nature is wildly unpredictable, and that's what makes it great. Some photographs require hours of driving, hiking and waiting for multiple days or months or even years, before you get that one shot you've been chasing. Some images are captured after a crazy adventure you never planned. In other instances, you might look out your window and see something worth taking a photo of that requires no more work than putting on some shoes, walking outside and pressing the shutter. Every photograph has its own unique back story. Some stories are pretty mundane. Some stories I will probably keep to myself forever, and some I feel are worth sharing with others, to give a glimpse into the crazy unpredictable world of nature photography. Planning that went to hell, some dumb luck, determination, a bit of danger, intuition, passion and of course, fun. Enjoy! And please forgive the quality of many of the photos and videos. A lot of them were shot with my cell phone. So this is how my story starts. In the car, driving. Driving straight. Driving straight for roughly 18 hours. This is the standard view of Interstate 80, probably in Nebraska or Iowa, it's hard to tell, they look the same. I was on my way back to Colorado from Wisconsin where I was visiting family. This is a drive I've done so many times I've lost track of the number. Once you cross the Mississippi, the drive across the plains is pretty much this. Farmland, pavement and a bug splattered window is about the only scenery you get. Not that I don't find these areas beautiful, but when your goal is to get from point A to point B, this part of the country doesn't make for an interesting drive. I'm a pretty experienced road warrior and always do this drive straight, stopping only for gas. About 14 or 15 hours into my trip home, I crossed into Colorado. This is the part of the trip where I'm starting to get a little loopy, but making it to the final state usually gives me the final burst of energy I need to make it home. 15 or so miles past the Colorado border, I noticed a big storm in the distance. 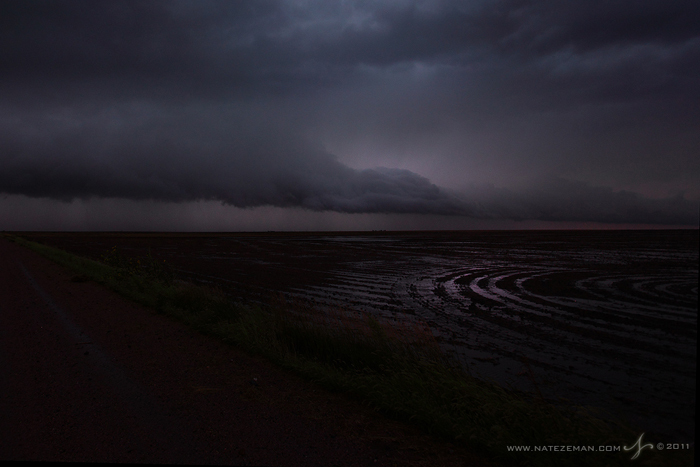 This storm was producing a lot of lightning, and I thought it might be good to take some photos and stretch the legs. I got off at the next exit. It was one of those exits that you assume no one ever really uses. The pavement of the Interstate exit ramp ends abruptly with a stop sign and a dirt road that disappears off into the horizon. I love these kinds of roads. You can usually wander and find something interesting to photograph in these remote areas. Farm relics and old barns dot the landscape.The weather was closing in fast and the most interesting thing I found was this little decrepit shed. I wasn't really hoping for anything spectacular. Mostly, I wanted to get out of the car for a few minutes and breathe some fresh air. I only made it out of my car for a minute or so. 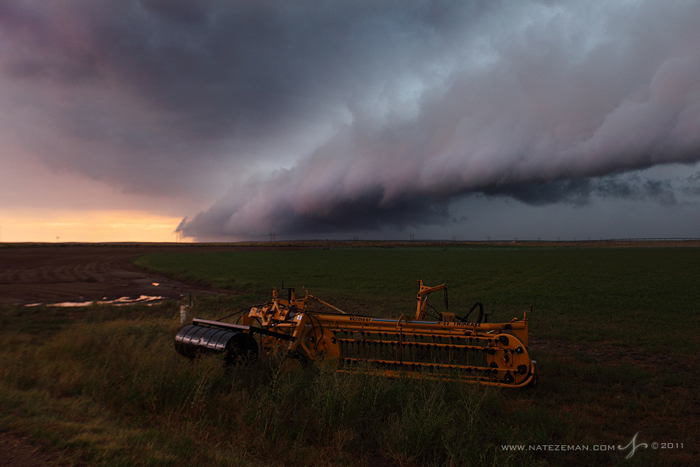 Just as I arrived at the little shed, the storm had moved closer to me and quickly took on a much more ominous look. I've lived in the Midwest most of my life and I'm very familar with how your senses react to a big storm coming. You can feel it in the air. Although I didn't really need any senses other than my eyes to know I probably shouldn't be here. 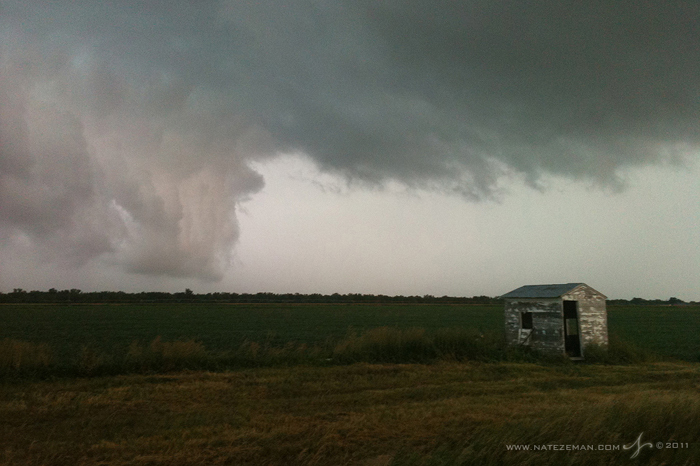 The large wall cloud that dropped out of the sky was evidence enough. 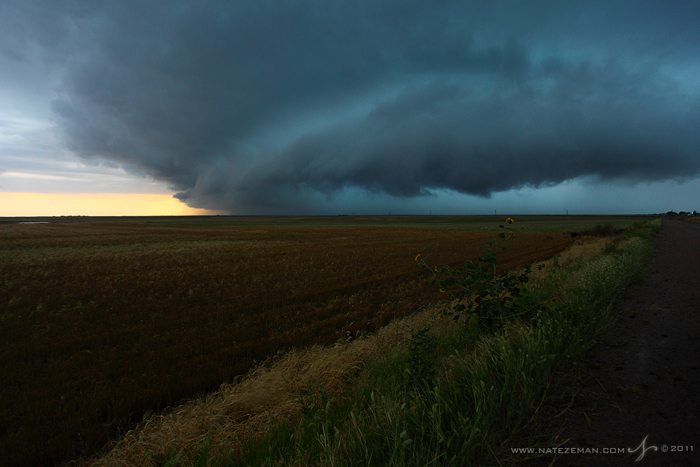 Wall clouds are a lowering and rotating base of a cumulonimbus cloud. The reason to look out for them is that these are the clouds that potentially spawn tornados. This one was headed in my direction. 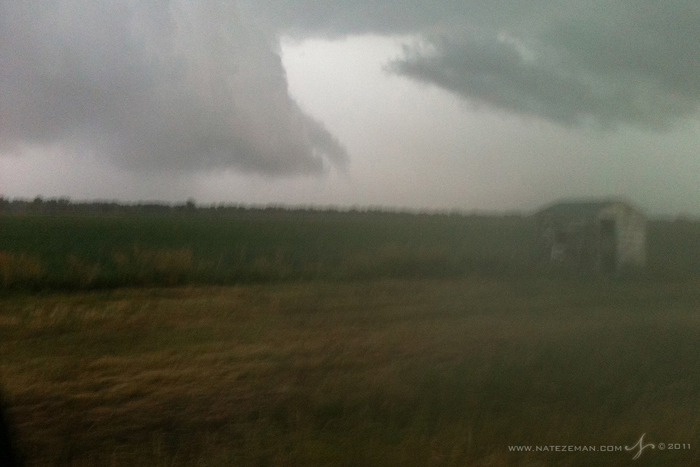 In the time it took me to break down my tripod and get back in my truck, a funnel cloud had formed. Time to get out of here and keep along on my western course. This was the point where things got borderline scary. This photo was the last one I got of the funnel cloud. 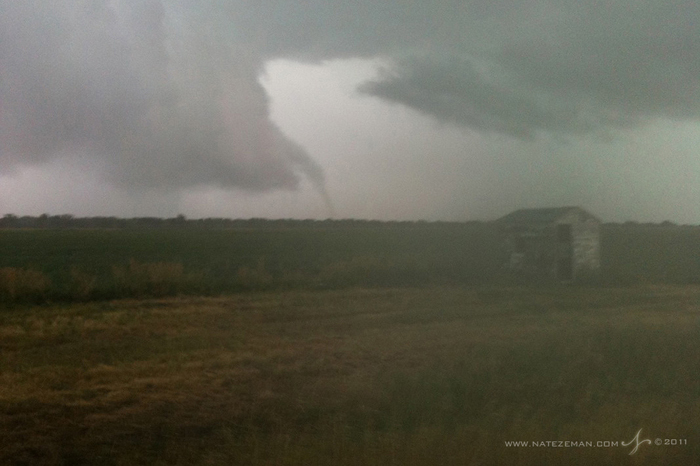 After, I was able to see it touch ground and form a tornado. Soon the wind and rain overtook me and made visibility impossible. I really wasn't sure what to do at this point because I could no longer see and had no idea in what direction the tornado was headed. I've been in some terrible storms in my life, but never anything like this. If I had to guess, I'd say it was very close to me. 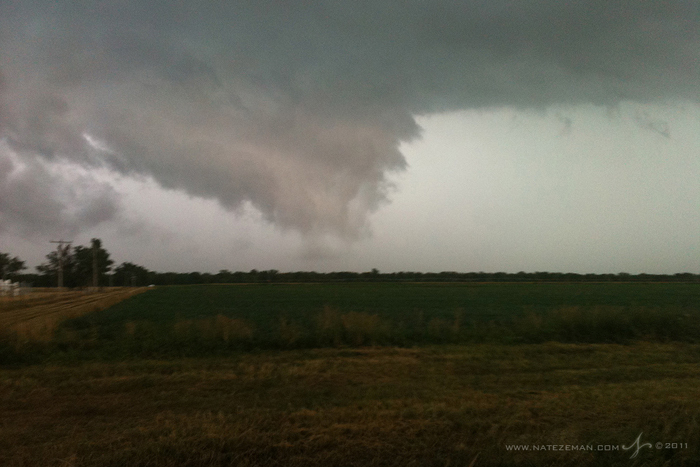 I was at a dead end and the only way back was toward the area where I'd seen the funnel cloud. I decided staying put was the best worst option for me. 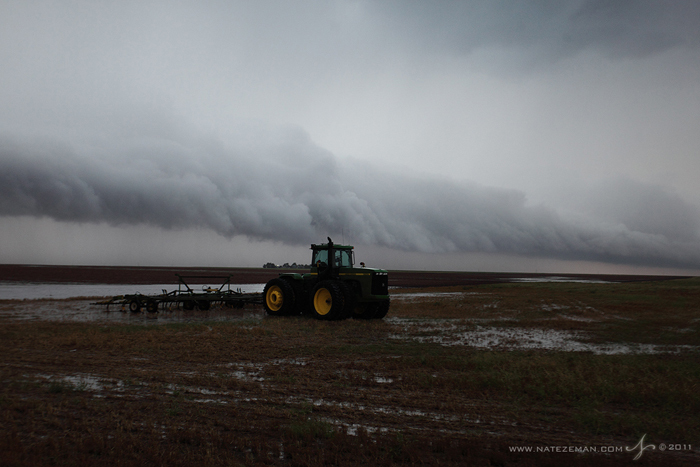 Farm roads on the plains turn to mud rather quickly, and this storm had dropped a ton of rain in just a few minutes. The wind was so intense at one point that it moved the back end of my truck about 3 or 4 feet in the mud. The most intense part of the storm only lasted a minute or two. Once I felt reasonably safe, I shot some video of the wind and rain which were still raging at an incredible speed and intensity. Now that I was in the clear, I took out my phone and looked at the weather radar. I was curious to see what the storm I was just in looked like, and how close it still was. Once I waited roughly a year (cellphone service isn't that great out here) the map loaded and I noticed that there was another large storm front about 30 miles northwest. It was headed my way. Now, the photographer in me kicked back into gear because this storm looked like it had a large leading front that would make for some really dramatic photos. Farm roads on the plains are basically just a huge grid that go on forever. Knowing that, I just set out toward where I thought I might run into the next storm. This time I would have the advantage of knowing it was there, and where it was headed. A few muddy, slippery roads later I found the next storm. This storm was also producing a lot of lightning and I was trying to capture that. The problem was that the storm was moving so fast that I would have to speed ahead eastward and then jump out of my truck to try to take a couple photos, but would have to jump back in and drive again before the storm overtook me. I never got my lightning shots but the storm itself was beautiful to watch. After repeating the driving east / stopping to shoot / driving away from the storm process that I described above, I decided to take one final picture. I then let the storm pass over me and started heading back to the Interstate (wherever that might be.) I think I might have been in Nebraska at this point, and being on hour 17ish of my drive, I wasn't all that happy with myself for backtracking a good distance. 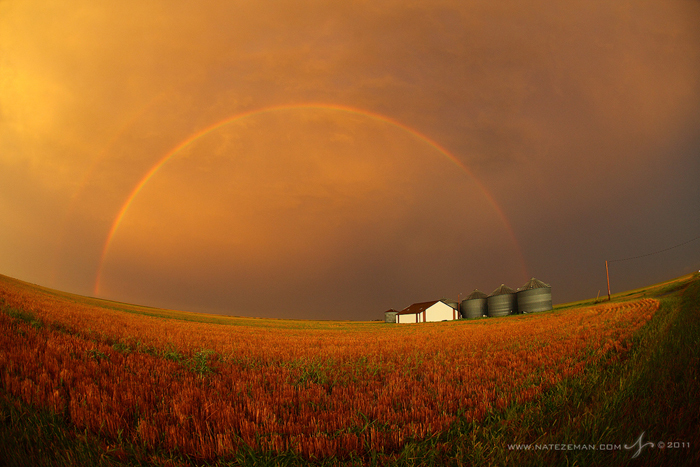 This was shot just before the storm overtook me. It passed overhead without much incident, but I was amazed at the volume of rain it was producing. Each drop felt like a bucket of water. Next thing I know, here comes the flash flood. I've seen plenty of these in my life as well, but never have I seen one come on so fast, and it wasnt something I was expecting in one of the flattest areas of the country. This made negotiating the muddy roads interesting. It wasn't until I reached an asphalt road and had a moment to free my eyes from concentrating on not driving into a farm field, that I realized how much water had really fallen. Everywhere I looked was underwater. I'm used to seeing flooding happen in an area where water would be expected to collect, like the lowest point of an area. But here it was just water as far as I could see. Thankfully, the paved roads are raised up. Driving on them felt like I was on some sort of bizarre farmland causeway. Low spots in the interesections of the roads were about two feet under water, but thankfully the rest of the paved roads were high enough to be above water. I was headed back to the Interstate now and was thinking to myself what a ridiculous side excursion this has been. Little did I know the scariest part of my adventure was just ahead. So here I was, finally back on the pavement, a couple miles from the Interstate. I was so ready to hit the road again. My windows were down because the inside of my car had fogged up so badly. The first storm I got caught in was so bad that water was somehow blowing into my car from places unknown. Now, the next part of this story is going to sound very dramatic, but this was exactly how it happened. I was driving slowly because it was still raining pretty hard and my windows were wide open in an attempt to defog the inside of my windows. I crested a small hill and was looking at a farmhouse that was surrounded by water. Then I heard a suspicius noise that I initially thought was something falling off my car. I mean, that wouldn't have been so unreasonable considering all the driving I had just done. But when I looked to the side, I literally was watching the road wash away from underneath me. I felt like I was in one of those cheesy end of the world movies where people are running away from a crack in the earth that is chasing them. Turns out it wasnt the whole earth, but rather a large portion of the road that I was currently occupying. Luckily, I sped away and the road washed out for only about 100 feet or so. Half of the road was just piles of rubble and mud. Luckily, it was the half I wasn't on. I was somewhat frazzled by the end of the world experience I just had, so I pulled over to stretch my legs and get my bearings. It was then that the night began to turn around for me. As usual my brain is on auto mode when it comes to looking for photo ops. I looked back up the road I had just come down and noticed that these unbelieveably dark storm clouds were clearing the east side of the road. To the west, was pure blue sky all the way to the horizon. If you're a photographer, you know where I'm going with this. It was only about an hour until sunset and this was as sure a bet as you ever get in photography that you are about to get stunning light. I immediately made the wise decision to turn around and go up the road that had just tried to eat me. I'm not sure why I was confident that the half of the road I just made it over would hold a passing truck for the second time, but I think it had something to do with me knowing that something special was about to happen. When I got back to the caved-in section of road, I hopped out to get it on video, because I was sure no one was going to believe my story. I might have even taken it so that I believed it really happened. Whenever I'm doing anything, besides, I guess, sleeping, my eyes are always looking at things from the perspective of a photographer. 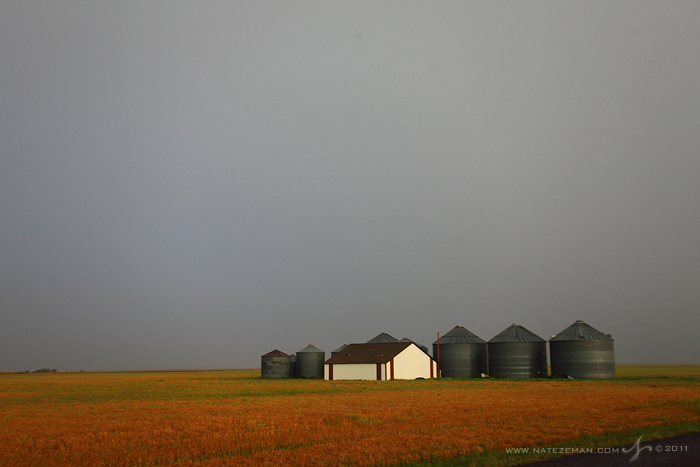 I had passed this small shed and silos a few hours earlier and took a quick snap of it. This was the most interesting thing I had seen in miles, and wanted to remember it should something arise where I would need an interesting foreground subject. 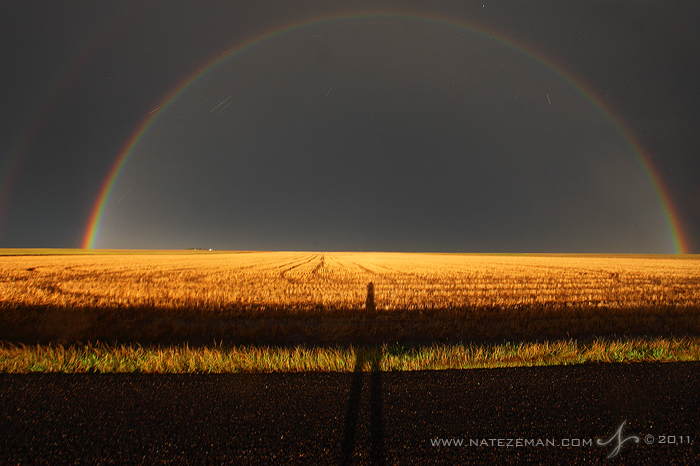 As luck would have it, I did need a location with an interesting foreground, so I made a beeline for for this spot. I figured this was my best option rather than risk missing the rainbow that I knew was imminient looking for something else. This is why it's always good to plan ahead, even when you don't know what you're planning for. 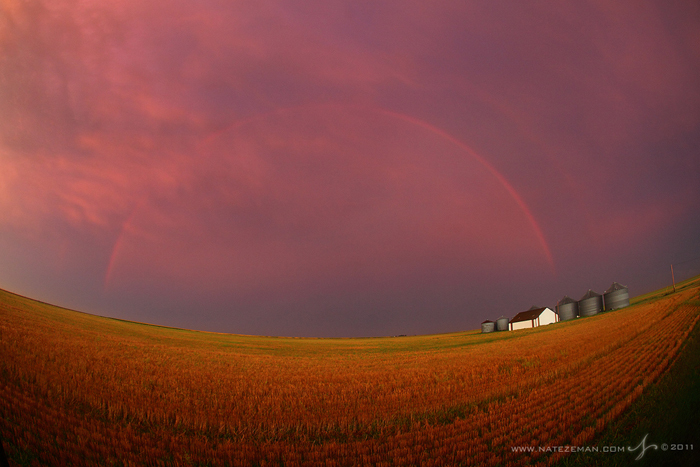 As soon as the sun cleared the veil of dark sky, a spectacular rainbow appeared. This is what I was expecting. I didn't expect it to be so dramatic. 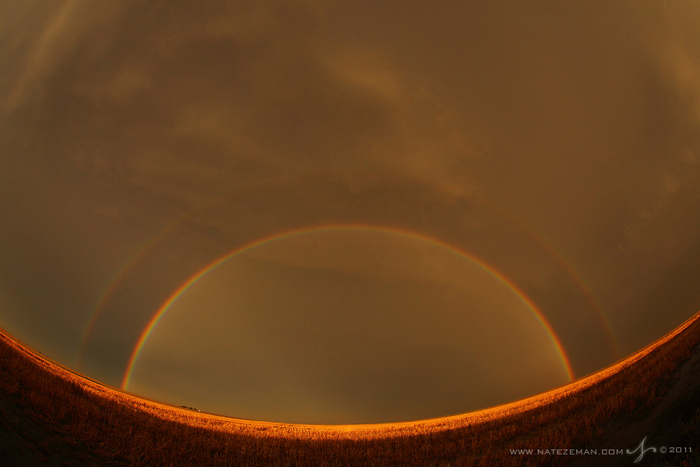 The full double rainbow was the most intense in contrast that I've ever seen. Don't worry though. There was still one more ridiculous thing to happen to me yet. 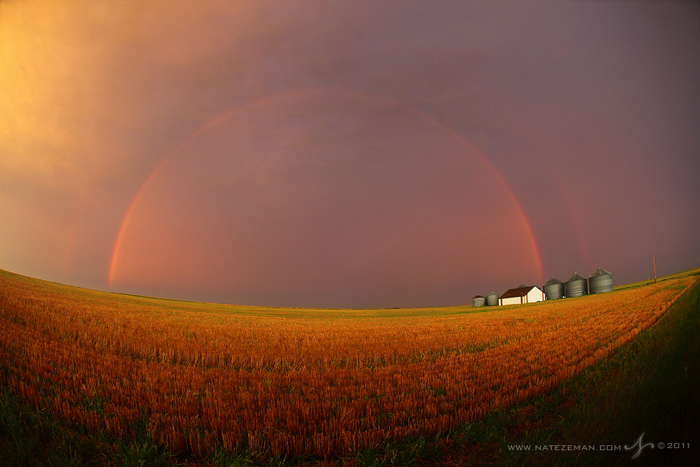 My first problem was that the rainbow was so big and so close that my widest lens didnt fit both rainbows in the frame. Secondly, the roads are raised so that no matter where I stood, I was casting a 50 foot shadow into the field in front of me. I wasn't looking to do a self portrait. I first thought I could remedy this situation by going on the other side of the road where its lower and hope the road would block my shadow. Now, I think is a good time to mention that A.) I was loopy from 20 hours of driving, 5 of which entailed assorted ways of trying to kill myself and B.) I was wearing shorts, sandals and a t-shirt. I was dressed for comfort, not for running around chasing storms. WIth that said, my attempt to jump the ditch that was now a rushing river, was quickly thwarted when my foot and sandal sunk about two feet in the mud at the same time as I tried to jump. Obviously the only way this story could end is with me completely underwater in a ditch on the side of the road. If there's any good part to this embarassing story, it's the fact that I've scrambled around enough sketchy places in my life to know that when I fall, the most important thing to do is keep the camera held as high as possible. (Always remember to sacrifice your body for your camera!) The first step I took out of the ditch didn't go that well either. My foot came out of the mud hole but my sandal did not. With this otherworldy scene still unfolding before me, I wasn't interested in saving my sandals at this point. I did, however, grab a stick on the side of the road and jabbed it into the dirt near where I lost my sandal in case I'd have a change of heart later. Alright, back on track. 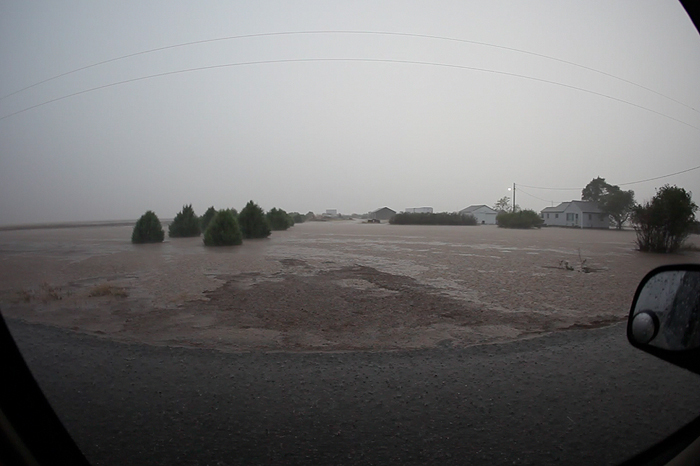 Now barefoot, soaked with mud and water, I went back to the car and put my fisheye lens on. This way I could fit the entire shot into the frame. I was no longer concerned about the shadow issue. After my swim on the side of the road, it had become apparent that I could simply sit in the mud and lay back as much as I could. The exposure was an easy one, but it was still raining heavily and it was nearly impossible to get a shot off before rain was covering the lens. I was lucky to come away with a few that didn't. A long lens shot of a barn off in the distance. I checked.. no gold. For the next 30 minutes or so I just sat back and watched the sky change. Last little bit of light of the day. 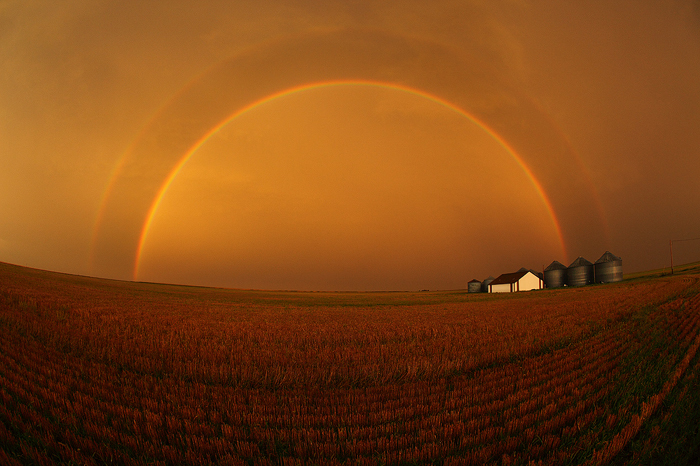 The rainbow is starting to fade. After the rainbow show was done, I made my way to the Interstate. 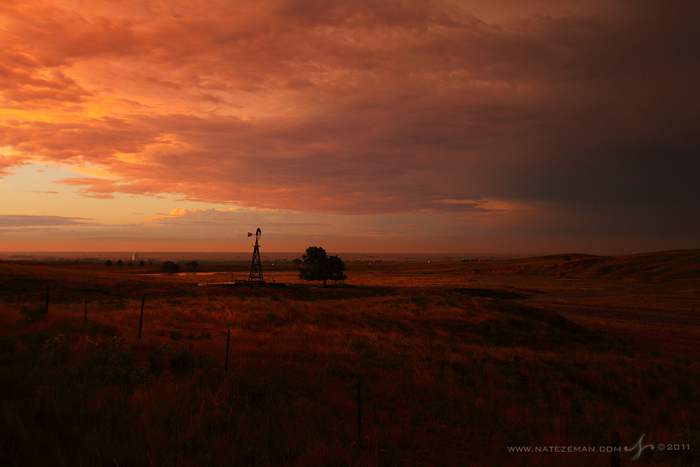 I pulled over and took one last shot of the sunset. I decided the only way to make the four hours that were left of my drive tolerable would to be if I was dry. So I ended up driving the rest of the way home in just my boxers. TMI, I know, but it's part of the story. Don't worry - no one was around this area! All joking aside, this was one of those crazy days where I thought I was just going to finish a boring drive home, and ended up with a crazy memory of a crazy day, and photo that is really special to me. These are the kinds of days I live for. You can order an exclusive limited edition fine art print of "The Gift" here. Also If you would like to download this image from National Geographic as a high resolution desktop image, you can do that here. Oh, and the question you've all been wondering. YES, I did go back and find my sandal. So don't go looking for any souveniers! Hope you enjoyed this edition of Behind the Image!